Grain-based breakfasts have been shown to cause a larger impact on insulin levels than eggs and other high-protein options. They trick the body into craving and desiring more carbohydrates and quick sources of sugar because they raise blood sugar levels. Grains might also leave you with an erratic stomach and a foggy brain if you suffer from carbohydrate intolerance or candida issues. Quality sources of protein, healthy fats, and fiber from foods such as chia, flax, hemp, almonds, and coconut flour have been shown to reduce blood sugar levels and reduce cravings. However, it’s not very easy to find a reasonably priced granola bar made with quality ingredients. Thankfully, this doesn’t mean you have to go without the convenience of granola bars forever. 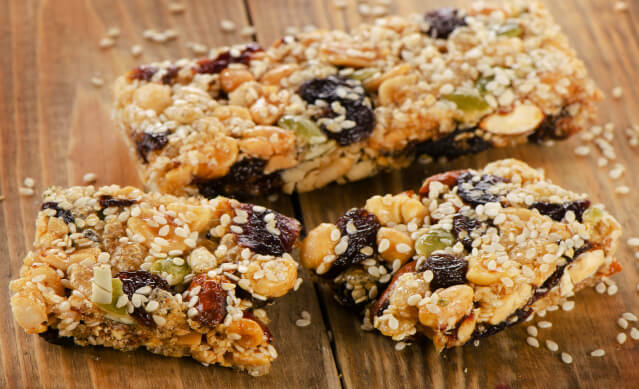 You can quickly and easily make your own granola bars at home with healthy ingredients. These ingredients are well worth keeping around since they also have many uses aside from just granola bars. Although the term “granola” technically refers to grain-based bars, you can still make a nice, crispy-yet-gooey bar that has a very similar taste without using grains and without the resulting high blood sugar spike. The ingredients you choose make all the difference to how your bars taste, how well they digest, and how they make you feel. 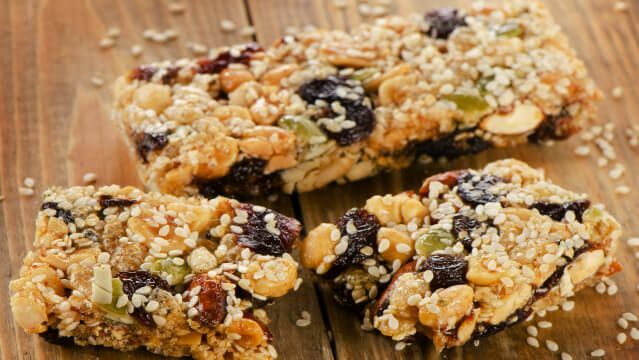 Below you’ll find a special recipe to make bars that are rich in all the nutrients you need to support blood sugar levels, including fiber, protein and healthy fats. To sweeten the bars without sugar, we’ll use two superfoods that help support overall health without a harsh impact on blood sugar levels. These two sweeteners are mulberries, a low-glycemic superfruit that offers a slight caramel flavor, and raw honey to help the bars hold together and enhance the sweet flavor. The entire recipe can be mixed in a food processor (or you can use a high-speed blender), which makes the preparation super fast and makes cleanup a breeze! So, let’s get started! First, put your mulberries in a small bowl just barely covered with some water — a few minutes of soaking time will help them blend better. Once soaked, keep the soaking water to use in step 5. Next, gather all your dry ingredients together. Add to a bowl and toss well to combine thoroughly. Set aside. Grease an eight-by-eight inch glass dish (or brownie pan) with coconut oil and set aside. Melt your coconut oil. I like to do this by putting it in a ramekin and placing it on the hot plate of my coffee maker. This melts the coconut oil slowly and prevents it from burning. Now, while you wait on the oil to melt, add your mulberries to the food processor with a quarter cup of the soaking water. Pulse until they’re a bit more broken down, just a few seconds. Add the dry ingredients to your food processor, and pulse several times so you get a crumbly mixture. Start running the machine and through the spout, slowly add the honey, then spoon in the raw almond butter. Add the melted coconut oil and let the processor run until you get a nice thick dough. Depending on your food processor and its strength, you might need to add 2 tablespoons more of water to get a dough consistency. You want it to be super thick but with no dry flours/seeds remaining. It should start to form a very thick paste so keep this in mind while processing. Turn off the machine and grab your dish. Using a spoon or spatula, scrape the mixture into your dish. Press with your hands so that the mixture is even in texture. Place in the freezer for 10 minutes to firm up, then cut into 8 bars to enjoy throughout the week. These are delicious bars that have a natural caramel flavor. The added crunch and rich flavor come straight from the coconut flour and the seeds. Feel free to sub in any other raw nut butters you like, such as cashew, hemp, or even pumpkin seed butter. I’ve used almond butter here since it pairs well with coconut, but all other raw nut butters would work here too. Be sure to store these bars in your fridge for the week, or you can store them in baggies in the freezer for up to one month. These bars are full of plant-based protein and omega-3 fatty acids, along with energizing saturated fats from coconut. They also provide more fiber than a bowl of oatmeal and help you reach your magnesium, potassium, vitamin E, and antioxidant needs each day. If you prefer a lower sugar alternative, you may also use coconut nectar (sap) in place of honey and omit the mulberries. You will, however, need to add a quarter cup extra of nut butter or coconut oil in place of the fruit and honey if you choose to eliminate both. These bars are naturally sweet but have a very low glycemic index per serving, which will train your taste buds to crave nutrients instead of sugar and unhealthy sources of carbohydrates. Honey is also full of antibacterial and antifungal properties, and mulberries are a great source of iron and are lower in sugar than dried fruits. Let us know if you give these bars a try — we’d love to hear your thoughts! Heather McClees is a professional health journalist and Certified Holistic Nutritionist from South Carolina.She received her B.S. Degree in Nutrition Science and Dietetics, and is most passionate about helping others discover the gift of of holistic health, showing others how to create healthy recipes based on their favorite foods, physical fitness and yoga, and creative writing. 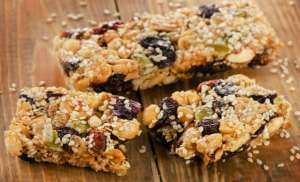 Hey Buddy!, I found this information for you: "How to Make Grain-Free Granola Bars Sans Sugar or Gluten". Here is the website link: https://www.thealternativedaily.com/gluten-gronola-bars/. Thank you.